I love it! But I do go back-n-forth on item #1 in that I feel CI *enables* collecting TD metrics. …Or, TD metrics collection *requires* Continuous Inspection. Items 2-9 however put into words, succinctly, something I’ve been desperately trying to say myself. Thanks for the kind words, Curtis! What would be your good counsel how to crisp bullet #1? If it isn’t obvious already I’m a big fan of the work coming out of the Agile Executive. I think collecting Technical Debt as a metric is synonymous with Continuous Inspection. My own view on #2 is that Continuous Inspection levels the field of developer proficiency, acting as a mentoring tool to ensure consistent code quality regardless of experience level and fostering more of a team environment. It also frees up developers from what amounts to grunt work to focus on solving business problems (the output). I think your bullet is consistent with that but maybe it’s not apparent. 1. 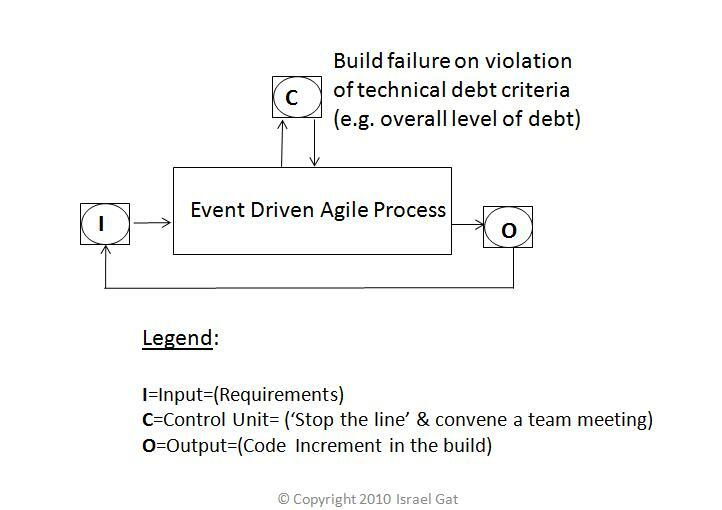 The technical debt metric *is* Continuous Inspection of the code through ultra-rapid feedback to the software process (see Figure 1 below). I also see #3 as more of an *augmentation* than a shifting of emphasis. We’re adding the qualitative assessment of the code (TD) to the already existing qualitative assessment of the software (functional testing). 3. It augments qualitative assessment (software testing) with quantitative measurement of the quality of the *code*. Caper Jones tells us quality is like security, it has to be baked into every step of the SDLC and not just one discreet activity. TD fills a big gap in that regard.